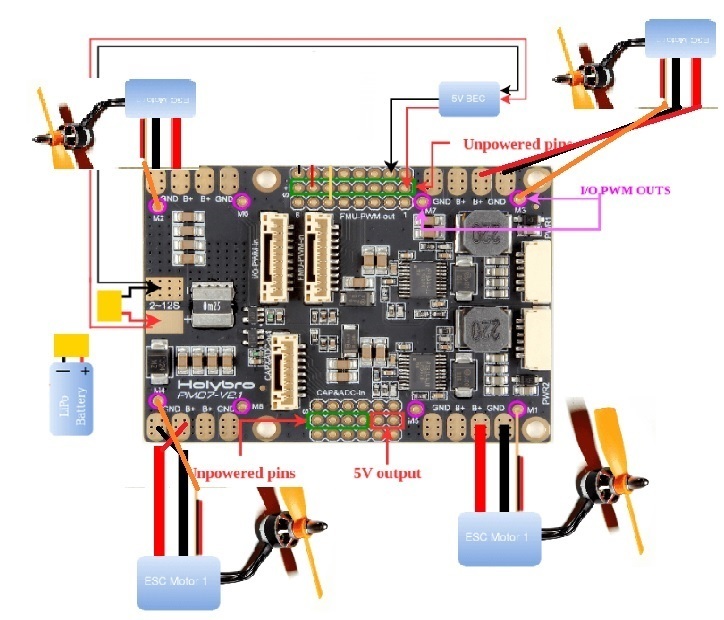 BEC 5V with 3A is need for pixhawk 4 PMB? External BEC 5V with 3A is need for pixhawk 4 PMB? I am using BLheli 30 A build-in 5V 2 A ESC in my quadcopter. my connection from pixhawk 4 to PMB are FMU PWM out to I/O PWM in. kindly give your suggestion ...Thanks. The 5V BEC is only needed if you need to power a servo motor or some other device that needs 5V. If you are just using brushless motors with ESCs that have a 5V BEC built in then you don't need to provide 5V to the pmb. Let me know if you have further questions. I have posted my problem in youtube.. need your valuable commands Plz. What airframe did you choose from qgc? quad x? Moreover did you disable the IO using the SYS_USE_IO parameter on qgc? If it is enabled the motors will be mapped to the IO pins and not fmu. By default PX4 outputs the motor pwms on the IO port. Either try to connect to the IO port or check the SYS_USE_IO parameter. If you want the pwms from the FMU port then this parameter has to be disabled.